After months of work (4 to be more exact), the cancellation of the initial scheduled due to almost 20 days of rain took us to the re-scheduling of the event for the April 30 and may 1, which took place in the town of Lezama, Pcia de Bs. As. 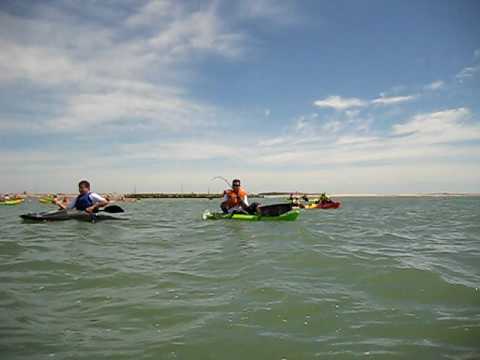 The event of Kayak completo Sot (plastic) big country known as “Crossing chained”, in the year 2016 version, received a total of 241 registered participants from different parts of the province to participate in the well-known recreational kayak/adventure event. The place chosen as the point of departure was the fishing vessel La Amistad located on the national route No. 144,200 km. 2. on Saturday, April 30, at 10 am about participating of Lezama, La Plata, Mar de Ajo, CABA, Baradero, Dolores, Castelli, Chascomús, Brandsen, wolves, Monte, Las Flores, etc. entered laguna Chis Chis to begin the adventure. First stop for the intronacion of our Lady Stella Maris at the point more high of the lagoon, where also placed a cross of 9 m high which will serve as a point of reference to guide the fishermen. Second stop was to rest for feed and refuel, then search the course us perimitiria arrive to “El Pinar”, a sector more than privileged lagoon splint, chosen as camp base. Once in camp, held the Assembly of tents, fishing, trekking and moments of mates and relaxation according to the preference of each participant. At night, grilled BBQ (meaning: Abbreviationfinder.org), more precisely 200 kg of meat and 500 hooligans for the delight of all and each one of us.Music, fireplace, drinks and fun were the prior to the break. Arrival overnight, each step to disarm your tent and loaded belongings on trucks from the municipality, which would be brought back to the point from where we had left the previous day. Time for the group photo that retrataría so magnificent a single weekend and then back to the kayak’s!. The cold… that cold? “.. .only a story for us in”Chained”crossing the climate was and will always warm”. Thank rescue craft for its work, the members of KP for the coordinated work to go and attend to all the municipality, its officers and employees, to Kayak Argentina magazine, to the sponsors, our families, the owners of the field, the fishing vessel La Amistad and mainly to those who took the decision to enroll and participate in other Platense Kayak event. Graciassssss, Kayak Platense – outputs, meetings. Good people! I wanted to thank you for the beautiful weekend that made me live, an unforgettable experience, especially wanted to thank a boy, not be name, that when we were back and despite the distance that separated us was realize that something was me, approached at high speed despite the waves and there you couldunicar com which was thus I felt bad for my diabetic condition, without hesitation he reported it and before you give me account already was above the boat with my kayak and run by the people who were there, this wanted to leave testimony and thank all those who attended me, leaving a sample of the huge professionalism of the people who took care of us and the Organization’s commitment , thanks again! And a hug to everyone who helped me! Thinking of doing sport fishing for the tourist town of Paraty (RJ)? A great accommodation option is the House Tulip. “Vintage and home of grandma’s day”, thus defines the manager of the inn, Patricia Vieira. The space is ready to receive lone travellers, groups and families. The House Tulip, besides the great environment, it is practically next to the beach of bairro Jabaquara, five minutes from the centre of the historic town of Paraty. The House was rated 8.7 by our site. The waters of Paraty are sheltered, so calm and protected, and with diversity of species: sea bass, grouper, jack, and much more. In addition to the practice of sport fishing, is ideal for sailing, stand up kayaking, and others. Not to mention, the colonial architecture of the city, which attracts and moves the nights of the historic center of Paraty. A complete program for all ages and the whole family. Flat: 1 bedroom with double bed and 1 single bed, air conditioning and ceiling fan, 1 room with a double sofa bed, table with 4 chairs, air conditioning, tv, ceiling fan, 1 full kitchen with private bathroom.